» Botany Photo of the Day » 2008 » August » Berberis sp. The photographer behind today’s image is Jack Dykinga, who I assume must have done some work for the USDA’s Agricultural Research Service at one time (unless there are two exceptional photographers named Jack Dykinga). Artistic work commissioned by the US government has few restrictions on its reuse, and in this case, the photograph is licensed under the Creative Commons. As noted on the above-linked page, this is a photograph of an Osmia ribifloris on a species of Berberis. The bee is commonly known as a blue orchard bee or, due to its success as a commercial pollinator of blueberry crops, the blueberry bee. In the wild, it is typically a pollinator of Californian manzanitas. Wikipedia has an intriguing entry on Berberis (or barberry); the write-up for the genus includes details about the use of some species as spices or foods in Asia and South America. Somewhere around five hundred species of barberry are thought to exist, growing in temperate and subtropical regions of most continents except Australia (and, it goes without saying, Antarctica). Nature’s colors are amazing but Jack’s capture is fantastic! What a treat to wake up to. Daniel – this is interesting, because historically *anything* created by the US Federal Government (but sadly, not state governments) wasn’t just creative commons licensed, it is 100% public domain. but it’s inconclusive on licensing terms for images from the USDA Agricultural Research Service. I did send an inquiry to the email address on that page and will report back here if I hear anything. Disease spread to wild bees from commercially bred bees used for pollination in agriculture greenhouses may be playing a role in the mysterious decline in North American bee populations, researchers said on Tuesday. Beautiful pic, beautiful flower, amazing bee. Makes me want to go out and sit in the garden! Hi Eric – whether a photo by a US Federal employee is in the public domain or not, depends on whether they took the photo during their official duties. If the photo was taken in their own time outside of contracted working hours, it can still be copyrighted. So photos on USDA websites are not necessarily public domain. …i must say…’this’ bee has personality…outstanding..! how WONDERFUL! my son and I’ve just found a dead blue bee and were still trying to get potitive ID’s for it….this fellow ALMOST looks like it but I’m still not dead on positive? Such a gorgeous close-up of this fellow…spectacular colors! 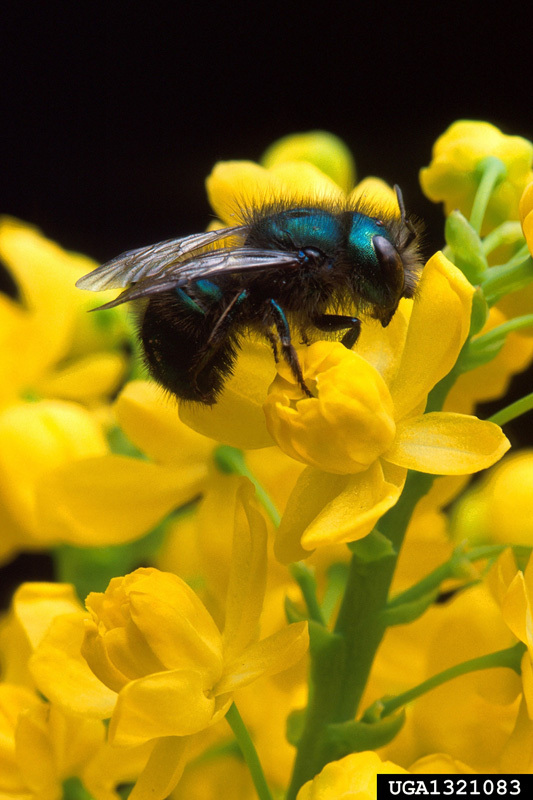 using Jack Dykinga’s image of a blue orchard bee you may do so. oh to fly and bee free…woe is me…to walk and bee me…. A good article and link. The issue of greenhouse bees passing on their parasites to wild bumblebees is exactly analogous to the farmed salmon wiping out wild salmon populations in the waters off BC coast. Same bio or eco logical principle. Leave a Reply to Mary Miller Click here to cancel reply.